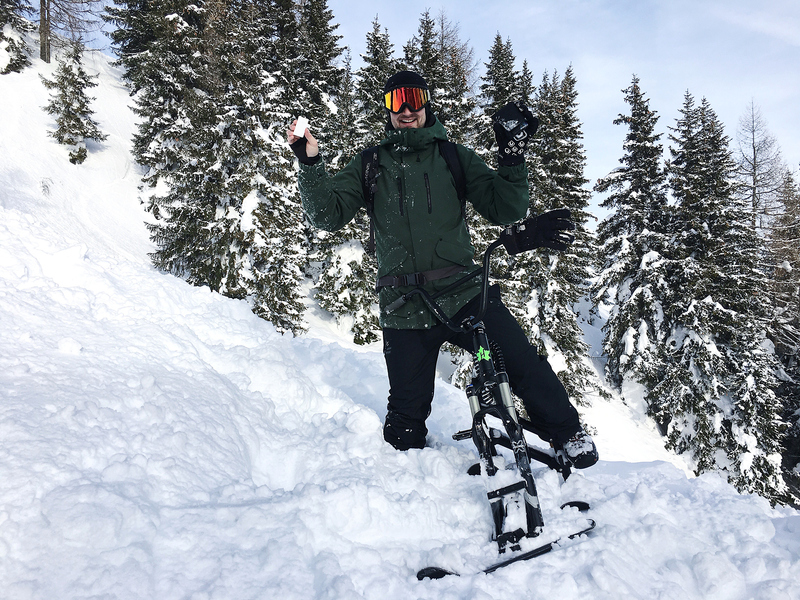 We were doing a shoot for Hillstrike on Flachauwinkl-Kleinarl in Austria and I found the perfect patch of clean snow to take pictures in. When we were done, we skied back down the ski slope and had a drink at the place at the bottom of the mountain. I offered to pay for the round, but I couldn’t find my wallet. At first, I wasn’t really worried, I just figured I put it in a different pocket than usually. When I checked all of them and still didn’t find it, I just opened the Chipolo app, since I had a Chipolo Card in there and I thought I’ll just make it ring. But the app showed that the wallet was last seen at a gas station on our way there, and I was sure I had it on me when we got to the ski resort. Turns out my Bluetooth was turned off, so the Card wasn’t even connected when I lost my wallet. I was sure I lost the wallet somewhere in the snow, so we went back up again, and I turned on Bluetooth on my phone and we slowly skied (triked?) down the mountain so that the tracker could connect to my phone. And it did! Then we went down in super slow motion, stopping every 3 feet and I rang the Card from my phone. The others were around me, completely still and dead quiet, so that we could hear it under the snow. We did this a few times and it must have looked really funny to anyone skiing by, but we found it! It was buried in snow near the spot where we had the photo shoot, it probably fell out when I was taking gear out of my pockets.